An otherwise healthy 83-year-old female was referred by her otolaryngologist for evaluation of acute onset of left-sided hearing loss with a clinical suspicion of acoustic neuroma. Contrast-enhanced magnetic resonance imaging (MRI) of the brain and internal auditory canals were performed using T1-weighted, T2-weighted, FLAIR, gradient echo, DWI, ADC, and postgadolinium-administration T1-weighted sequences. No evidence of mass, signal abnormality, or pathological contrast enhancement within the cerebellopontine angles or membranous labyrinths was identified. There was extensive signal abnormality within the periventricular and subcortical white matter, reflecting chronic small-vessel ischemia, but otherwise no evidence of acute infarct, hemorrhage, or mass was present. Incidentally noted was a small focus of brush-like enhancement in the right midbrain (Figures 1 and 2) with only subtle corresponding T2-signal abnormality and signal susceptibility on fast-field gradient echo sequences (Figure 3). 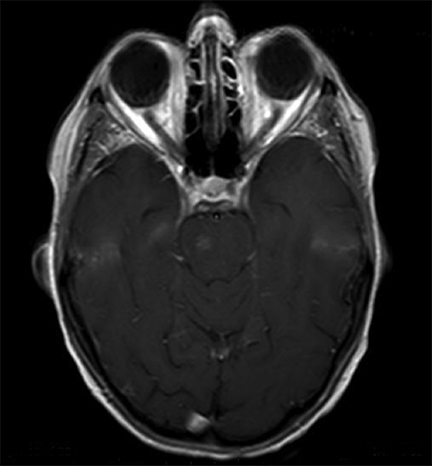 Due to the detrimental risks associated with brain biopsies, histological diagnosis of brain capillary telangiectasias is usually not available in the clinical setting.2 Diagnosis is rather mainly established based on imaging findings,5 particularly on thin-sliced, contrast-enhanced MRI. 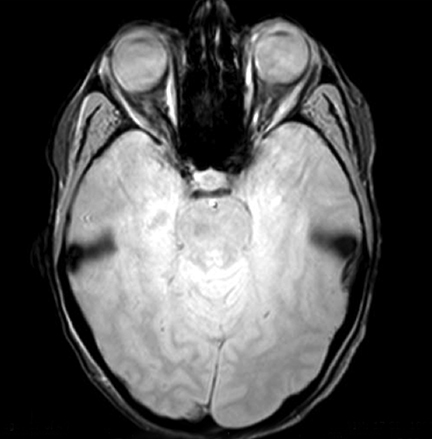 The subtlety of these lesions may make detection difficult on conventional brain MRI.3 Brain capillary telangiectasias are usually slightly hypointense or isointense on T1-weighted images1,2,4 and slightly hyperintense on T2-weighted images1,2,4 and proton-density sequences1,4 with mild “brush” or “stipple” like enhancement interspersed among normal brain parenchyma on T1-weighted images.1,2,3,4 The area of enhancement may not correspond to the actual extent of the lesion.5 Capillary telangiectasias also demonstrate increased susceptibility on gradient-echo sequences due to the presence of deoxyhemoglobin likely as a result of stagnant blood.1,2,3,4,5 Slow flow within these lesions is responsible for their lack of findings on angiography; they are classified as “angiographically occult.”1,2,3 Capillary telangiectasias are typically occult on computed tomography (CT) as well, but may demonstrate mild enhancement with intravenous contrast.1,3 The stability on follow-up examinations1,2,4 and lack of mass effect2 are other defining characteristics of brain capillary telangiectasias. Differential diagnosis of these imaging findings depends strongly on the location, but typically include, glial brain tumors,3 lymphoma, subacute infarct, active demyelination, or acute inflammatory process, such as acute disseminated encephalomyelitis (ADEM).1 Brain capillary telangiectasias are differentiated from these other lesions by clinical presentation and absent growth, though susceptibility on gradient-echo sequences may be a useful imaging distinguisher. Brain capillary telangiectasias are typically benign small vascular malformations found in the pons and midbrain. 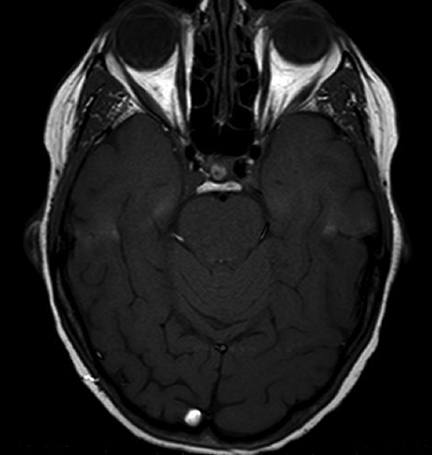 These lesions are usually silent on CT and angiography, but have characteristic presentations on contrast-enhanced MRI studies, specifically demonstrating susceptibility to gradient-echo sequences and “brush” or “stipple” like enhancement interspersed among normal brain parenchyma. Diagnosis is based primarily on radiographic findings and no further treatments are currently advised. Follow-up imaging may be obtained to ensure stability and to confirm the diagnosis. Lee R, Becher MW, Benson ML, Rigamonti D. Brain Capillary Telangiectasia: MR imaging appearance and clinic histopathologic findings. Radiology. 1997;205:797-805. Castillo M, Morrison T, Shaw JA, Bouldin TW. MR imaging and histologic features of capillary telangiectasia of the basal ganglia. Am J Neuroradiol. 2001;22:1553-1555. Sayama CM, Osborn AG, Chin SS, Couldwell WT. Capillary Telangiectasias: Clinical, radiographic, and histopathological features. J Neurosurg. 2010;113:709-714. Scaglion C, Salvi F, Riguzzi P, Vergelli M, Tassinari CA, Mascalchi M. Symptomatic unruptured capillary telangiectasia of the brain stem: Report of three cases and review of the literature. J Neurol Neurosurg Psychiatry. 2001;71:390-393. Pozzati E, Marliani AF, Zucchelli M, Foschini MP, Dall’Olio M, Lanzino G. The neurovascular triad: Mixed cavernous, capillary, and venous malformations of the brainstem. J Neurosurg. 2007;107:1113-1119. Kapnadak SG, Mikolaenko I, Enfield K, Gress DR, Nathan BR. Odine’s curse with accompanying trigeminal and glossopharyngeal neuralgia secondary to medullary telangiectasia. Neurocrit Care. 2010;12:395-399. Brain capillary telangiectasia. Appl Radiol. Prepared by Dr. Shatzkes and Dr. Wong while at Lenox Hill Hospital of North Shore Long Island Jewish Health System, New York, NY.